Who should consider a hepatitis A vaccine? How does the hepatitis A vaccine work? How often do I need to be vaccinated? How long does the vaccine last? How effective is the hepatitis A vaccine? Is there anyone who shouldn't get the hepatitis A vaccine? Which medications are used in the hepatitis A vaccine? How much does the hepatitis A vaccine cost? Getting the hep A vaccine, and using other preventive measures will help one to avoid hepatitis A infection. Currently there are no standard treatments for hepatitis A. Usually the body's immune system will clear the virus on its own. Travelers, children over the age of one, those with clotting factor disorders, medical-lab workers, men who are sexually active with men, illicit drug users, and anyone who desires to protect him- or herself should consider being vaccinated against hepatitis A. An inactive version of the hepatitis A virus is injected under the skin in order to build antibodies against the virus. The vaccine requires two shots given six months apart, and is sufficient for long-term protection from the virus. 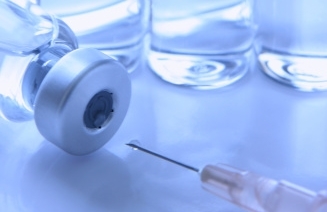 A shot of IG ( immunoglobulin) can provide limited protection in emergency situations or before visiting endemic areas, or until the vaccine has taken effect. When administered correctly, the hep A vaccine has a 95-100% success rate. Side effects, if present, should only last for 1-2 days and may include the following: localized tenderness around injection site, fatigue, headache, and loss of appetite. Is there anyone who should not get the hepatitis A vaccine? Women who are pregnant or nursing, patients with latex allergies, and patients who are moderately to severely ill should not get the hepatitis A vaccine. Patients who experienced a severe allergic reaction to the initial dosage should not receive second dose. Havrix® (Glaxo Smith Kline) and Vaqta® (Merck) are two products that you may receive. Havrix® contains preservatives, while Vaqta® contains no preservatives. In addition, a combination vaccine is available for both hepatitis A and B protection; the name of this vaccine is Twinrix®. Insurance sometimes covers the hepatitis A vaccine, especially for at-risk patients. Without insurance, estimated charges are $60-315 dependent upon geographical location as well as consultation and administering fees. The fees for the combination vaccine Twinix® total approximately $330-$700.